Next, you will apply an Filter to your text. Look at your screen and notice the Filter Label followed by the + sign in the Property Inspector. Click on the + sign to display the Filters available. See the figure below. You will note a number of options appear. 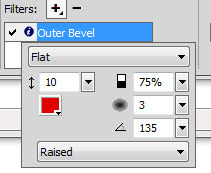 Select "Outer Bevel" as shown at the right. Your image canvas should look similar to the one shown below. Notice the Outer Bevel filter is now listed in the Property Inspector under the Filter Label. See the figure at the left. Doubleclick on the "Outer Bevel" text to display a dialog box that can be used to configure the filter. 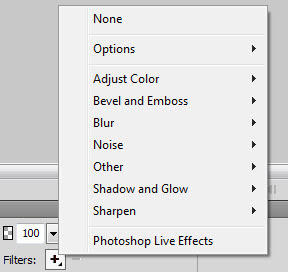 The color of the outer bevel filter is red. You may change it if you prefer. Try a turquoise color (#3399CC). Experiment with the settings. For a more subtle effect, change the width from 10 to 5. Try out different types of effects. It is currently set to "Raised" — try "Inverted" or "Highlighted" for a different look. Try changing the contrast, softness, and angle if you feel daring. Stop when you are happy with your text. Remember Edit, Undo (or Ctrl+Z keys) can help to correct any mistakes. Your image canvas may now look like the one shown below. 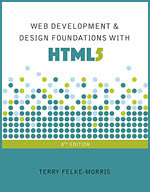 Continue to save your image for the Web.